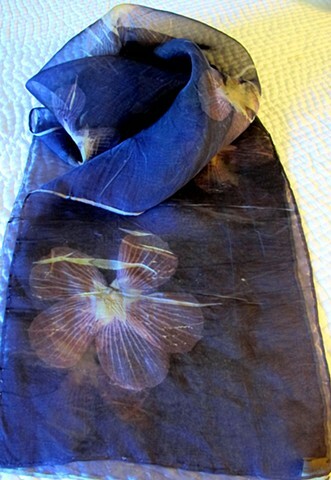 The most frequent inquiry I get on my web site is to teach someone how to make my Botanical Print Scarves. For the first time, I will be teaching this technique at Pocosin Arts, Columbia, N.C., October 4th-5th, 2019. The 2019 Workshop Registration is now open. My business name is Waterside Weaver because my initial artistic passion is weaving. Since then, my work has evolved to include a variety of fiber works from weaving, to felting, and botanical transfer printing on silk. I love the salt marsh, so it came naturally that I welcomed the challenge of printing the huge but delicate blooms of one of my favorite marsh plants, the Marsh mallow. Next, I started to collect and print the hibiscus, which was easier to find, and is also in the mallow family. The hibiscus has the intrinsic advantage of having such interesting leaves. You might be surprised to learn that the beautiful blooms of the Okra plant are also in the mallow family. I have found that the flower prints worked best when printed in combination with sheer silk organza, as the light weight of the silk lends itself beautifully to the delicate flower prints. It can be hard to wear a pretty scarf during the summer months, but these scarves are so light weight that they can add a pop of color and interest year-round. I will be bringing a sample of these botanical print silk scarves to the Market this week (September 1, 2018). My fiber art can also be seen locally at the Dare County Arts Council, or by appointment (www.watersideweaver.com). I am so excited that my love for Nuno Felting continues to evolve. Thanks to the recent instruction of Jean Gauger, my work is better than ever. I was so pleasantly surprised to receive an honorable mention award in the "16th Molly Fearing Art Show", Roanoke Island. It is always such a special and rare treat for fiber art to receive such recognition. Be on the look out for some really amazing work this summer, as I am feeling re-energized! 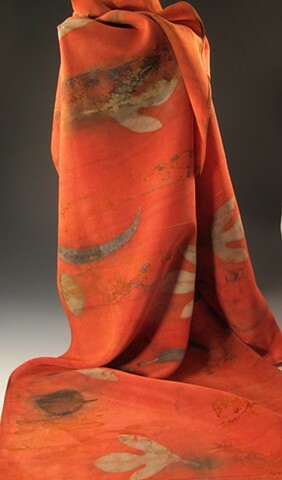 Shibori Tencel Shawls for Fall! A few of my favorite tencel shawls will be available just in time for fall. They make a great travel piece, light weight and wrinkle-free. You will find yourself reaching for this piece time and time again. Our first merino lambs have arrived at Island Farm, Millie & Ellie Mae. I will try to post pictures regularly since they are pretty darn cute. If you are interested in one of my newest creations, the felted wool "bubble scarf", I am currently weaving them & can individually dye one in the color of your choice. Just send me a message & we'll work to gether to create a scarf that you will charish. I have found that I can provide more personalized service by dealing with customers directly. If interested in my work, please contact me by posting a message, and we'll proceed from there. Once we establish availability, I can accept payments through Paypal or personal credit cards. Thank you. Recently released magazine article; PDF file attached.